We support PCs, Macs, iPhone, iPad, Android and Windows Phones. 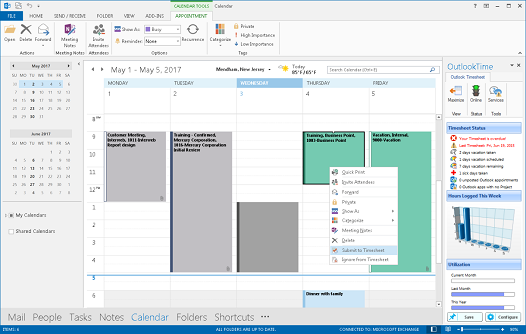 There's even a plugin for Outlook that turns your calendar into a timesheet! Turns Outlook into the world's fastest & easiest time tracking system. tools that help you organize, visualize, and schedule resources quickly and easily. Need to value or invoice timesheets? to work exactly the way you work. Supports iPhone, iPad, Android and Windows Phones and tablets. We offer a choice of 3 fully scalable editions with different feature sets. So whether you are a big fish with simple needs, a small fish with big needs, or you want to start simple and grow as you grow, with Timewatch®, there is a solution for you. We are specialists in professional services software. We provide both Cloud and Self-Hosted solutions, have offices in the US, UK and Australia, and have customers all over the world, ranging from small businesses with just a handful employees, to international enterprises with thousands of employees. Timewatch is used in an incredibly broad range of industries. Firstly, our products are highly configurable, so we can perfectly match your business needs today and in the future. Secondly, our support is excellent, we do not outsource, and although this costs a little more, we’ve offset this by designing software that needs less support than others. Contact us today, we’ll be happy to show you. Time&Space® – Combines time tracking, resource scheduling, expenses & billing in one. Our solutions are highly configurable and scalable which is demonstrated by the incredible range of industries that use our products. Organizations that range in size from a few employees to a few thousand. We are experts in time tracking, resource scheduling etc, and we are happy to provide you time with one of our product specialists to discuss your specific requirements. The familiar MS-Office look and feel not only makes users feel instantly at ease, it makes it easy for new users to learn the system. The elegant timesheet ‘grid’ mirrors the design of paper and spreadsheet timesheets. Whatever you call what your employees book time to, you can set the terminology to match your organization. The Google style search system saves time, suggesting customers & projects as users type. It also learns what items employees are working on and suggests them in ‘History’. 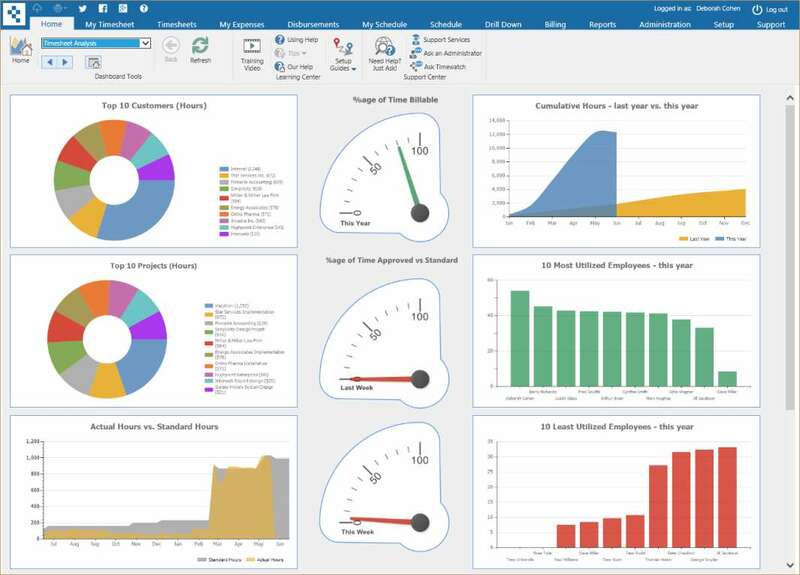 A personal dashboard shows employees current status such as: time off, vacation days remaining, utilization, task completion etc. Totals are provided both by day and by row. The mobile app supports all upports PCs, Macs, Linux, Chromebook, Phones and Tablets. 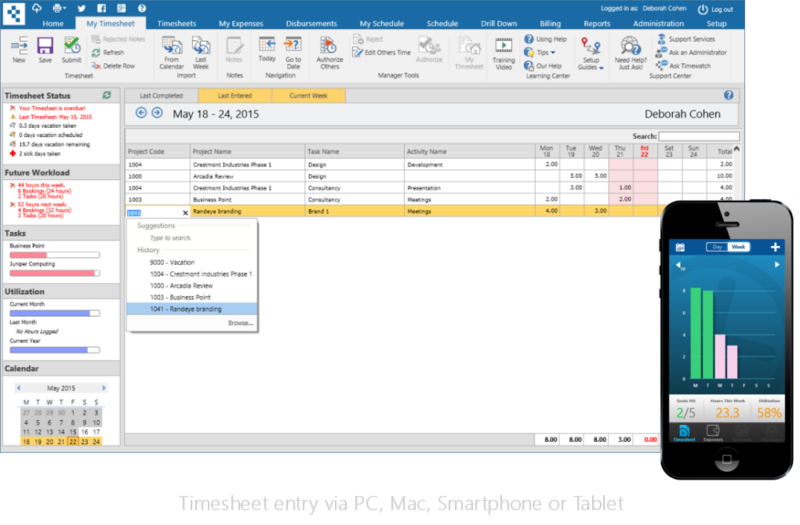 Timewatch® timesheet solutions let your users track time in the way they prefer: from a PC, Mac, phone, tablet, even from Outlook! Our timesheet systems are so intuitive and easy to learn that no training is required. With time-saving features such as instant search, import from calendar, post-appointments, and emails from Outlook, our timesheets typically save employees between one to three hours per week and pay for themselves in minutes. Timewatch® resource scheduling solutions are so flexible and powerful they are used all over the world by: airlines, banking, consultancies, defense, engineering, healthcare, IT, media, project management, recruitment and more. Our customers schedule everything from people, training courses and projects, to airplanes, satellites, equipment, and trucks. Schedulers can search by definable resource types, skills, grades, locations, availability, timezones or any custom attributes you define. Views are definable, you set the resources in view, the color of booking types and the information visible in calendars and mouseovers. Advanced features include forward ‘rough book’ planning, mapping and seamless integration with Outlook, Office 365 and Google Calendars. Whatever your to scheduling need, we can help. Users are instantly ‘at home’ with the Office style ribbon menu. Our customers’ users tell us they feel like they have been using it for years! Scheduling ‘Views’ are highly configurable. You can set the number of resources in view, the duration, the level of detail, the color coding are what appears in mouseovers. From the Support Center users can access a range of self-learning and self-help resources as well as access our excellent support services. Easy navigation, back, forth, or click on the ‘Go to date’ button on the menu. Bookings can be color coded by type: meetings, training, travel, vacation etc. You define the color coding, and soon everyone instantly recognizes who is doing what, when at a glance! Resource labels can show a photo and also a quick view of each user’s availability this week and in the weeks to come, which makes scheduling much easier. Easy communications. By hovering over an employee you can call, email, or chat with them. One thing all our customers have in common is that they need additional information stored against Bookings. Common items are: Customer, Project, Task & Booking Type, but there are more customer and industry specific items such as: catering for meetings, Purchase Order Number, Ticket Number etc. With customizable fields, you can configure the system to perfectly match your needs. If you schedule by skill, the system remembers the skill needed, so you can only drag or reassign a booking to someone with that skill. Yes, it supports all mobile devices ‘natively’. This means you don’t need to worry about what phone employees have, whether they’ve upgraded their phone to the right version and there is no organization data stored on the phone as it is a cloud application. The Outlook Timesheet system plugs into Outlook as a panel on the right hand side. The OutlookTime dashboard shows current status, but can be expanded to show a list of unposted items, edit them, add a customer or project, then post them. Click Learn More to see it in action. Dashboard panel shows current status: hours posted, hours available to post, vacation time taken, upcoming and available etc. Bar chart shows time posted so far this week. 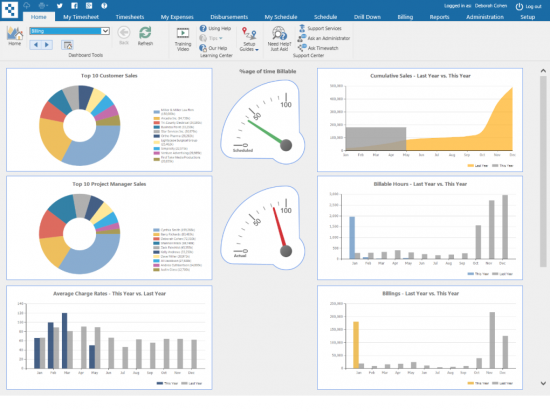 The dashboard provides many panels, gauges and charts which each user can personalize. OutlookTime does not change the way you use Outlook, it allows you to add Customer / Project details to appointments and emails, then post them to your timesheet. OutlookTime can color code appointments. Grey items have been posted already, Green are ready to be posted. Simply right mouse click and choose ‘Submit to Timesheet’. Users can configure OutlookTime to automatically ignore ‘private’ appointments. Timewatch time tracking, time recording and outlook provide timesheet billing. Customers say our Outlook Timesheet is the worlds best timesheet and best web timesheet and that WhiteSpace is the worlds best resource scheduling system. It provides Outlook timesheet reporter functionality and an ms exchange timesheet. Report on timsheets from Outlook. Resource scheduling systems allow for scheduling and planning of resources and projects. Also see our project office live, free timesheet entry system. See all resources. Still using outlook shared calendars? Try WhiteSpace® instead. If you use Outlook and enter timesheets, why aren’t you using OutlookTime®? It’s a dream come true for Outlook users as it takes information you already have in Outlook, and turns it into a timesheet! 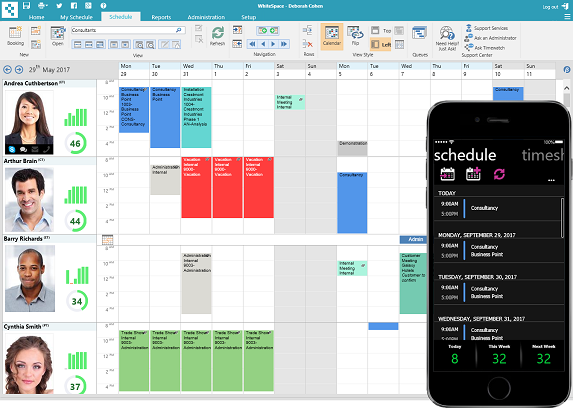 OutlookTime® does not change the way you use Outlook, it allows you to add customer / project information to appointments, then post them to your timesheet! Users tell us OutlookTime® saves them hours each week, so it pays for itself in minutes. OutlookTime® is made up of two parts, a plugin for Office 365, Outlook 2016, 2013, 2010 & 2007, and a reporting and admin system. 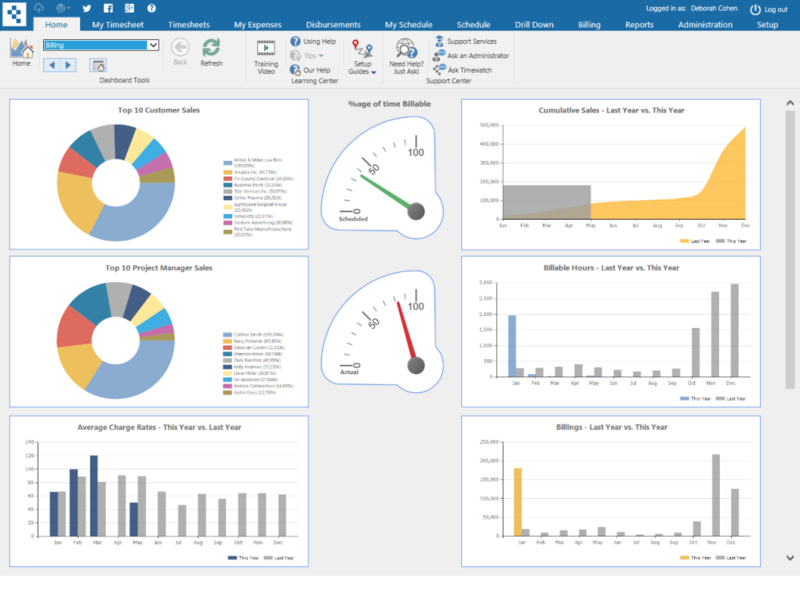 The Outlook plugin is available as an option with our Time®, Time&Money® and Time&Space® sytems, and included with our OutlookTime® solution. 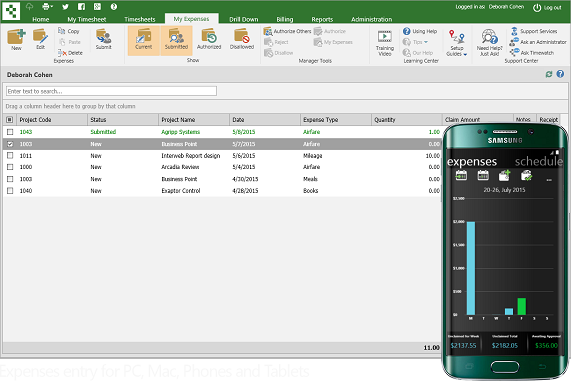 Expenses entry via PC, Mac, Linux, smartphone, tablet. Makes expense tracking fast, easy, and accurate. The Timewatch® expenses module is simple and easy for end users, administrators, and billing staff. Employees can quickly and easily log their expenses, allocate them to projects for managers to review and approve for repayment, costing to a project and/or recharging to a customer. Receipts images can be attached to claims while smartphone and tablet users can take a photo of a receipt and attach it to the claim in one step. Turn time into money, your way. No two organizations are alike. Some value time by employee, some by grade or role, others by project, type of work, or date. Many organizations need a mixture of these but almost all are forced to compromise in some way because of limitations in the software they use. With Timewatch there is NO compromise. We support almost every combination of rate type. Rates can vary customer-to-customer and project-to-project as well. Now you can value your work and charge for your time the way you work, not the way your software does. You have the best resource scheduling solution I've seen. Now we have efficient, accurate and scalable enterprise scheduling system and are not dependent on complex spreadsheets. Thanks! Our business is all about selling time, and this is what Timewatch does for us better than anything else. It is so flexible it solves every challenge we throw at it. With WhiteSpace® we make better resource scheduling decisions. We avoid recruiting too early and being overstaffed, or recruiting too late and being understaffed. Time®&Money helps keep us competitive. It gives us a better grasp on ongoing time costs and bill more accurately, faster and improves cash flow. No question of it, Time® has improved our effectiveness. I can see time by project and how close to budget we are, invoicing is more timely, we have no 'lost' hours and more data to back up invoices. Timewatch supports personalization, which is crucial for us as it allows us to meet our requirements 100%. It was a 'no brainer', the gains obtained from invoicing quicker month more than justified the cost. I love this timesheet system, it does exactly what it says on the box! We've gained a time recording system that links with our financials system and provides us with better project management, financial control and avoids duplicate data entry. With Timewatch we know who has and has not submitted a timesheet, which projects are making money and report back to our clients weekly on costs incurred on their projects.